On the occasion of the 55th Vietnam Orange agent calamity in Vietnam and the day for Vietnamese orange agent victims (August 10th 1961 – August 10th 2016), in the morning of August 9th, Cần Thơ city’s Orange agent victims’ association organized visits and gifts presentations to orange agent victims and their families in Ninh Kiều and Cái Răng urban districts. Accompanying was standing vice secretary of Cần Thơ city Party Committee Phạm Văn Hiểu. 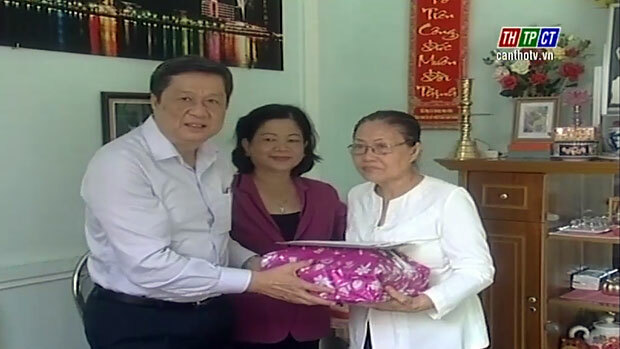 The delegation visited Mr. Nguyễn Tráng Sĩ in Xuân Khánh ward, and Ms. Trịnh Thị Linh Phượng in An Khánh ward, who contributed to struggle for national independence and freedom, infected toxic chemicals in war. The delegation visit Ms Trần Kim Phượng – dioxin victim in Lê Bình ward, Cái Răng district. At the destinations, Mr. Hiểu warmly asks and encourages the victims and their families to strive for overcoming and stabilizing their life. At once, he offered gifts to them, each gift costs VND 1 million 200 thousand. He directed authority at all levels, unions, agencies continue concerning and caring the victims and their families. Furthermore, visiting Cần Thơ city Center for Social Tasks, located at no.25/1, Tầm Vu Street, Hưng Lợi ward, Ninh Kiều district, with 85 orphans, handicapped and dioxin children, Mr. Hiểu warmly asks their health and recognizes efforts of officials and staffs in recent years. He encourages them to continue promoting gained results, overcoming difficulties, and well implementing unit’s missions./.